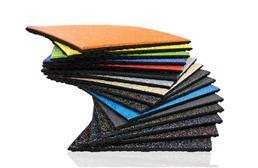 What's the Best Flooring for CrossFit? 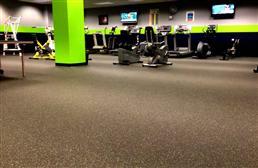 Welcome to the lexicon of commercial gym flooring. 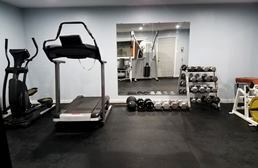 At RubberFlooringInc gym flooring is our specialty, and we have been supplying high level commercial gyms along with smaller personal training studios with durable, high quality rubber flooring for over 8 years. You will find an comprehensive collection of gym floor rolls, tiles and mats to set the foundation for a flourishing business. 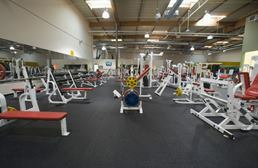 We provide the fastest lead times on the market with many flooring options shipping in less than 7 business days, which means you can open your new gym even sooner than you imagined, Our gym flooring options come with lengthy warranties certain to keep your floor standing strong for years to come. For any business owner, the look and feel of your business is vital to your success, and the look and feel begins with your floor. Commercial gym flooring is no different. 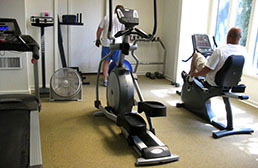 In fact, if anything your commercial gym floor is more important because it contributes to safety as well as aesthetics. Additionally, your commercial gym floor needs to be durable, dependable and versatile enough to support all of your clients from the light lifter to the Hulk. 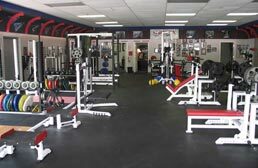 Not all commercial gyms are built the same or have the same needs and we want to make sure you have the best commercial gym flooring for your gym to be successful for years to come. Do you have a smaller space? 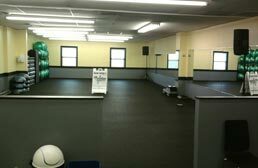 Are you installing your commercial gym flooring yourself? 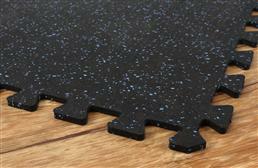 If so, tiles are a great commercial gym flooring option. 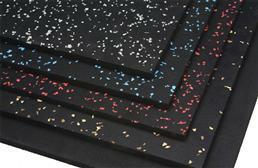 In a wide range of thickness options, commercial gym tiles are approachable, intuitive and an easy DIY project. 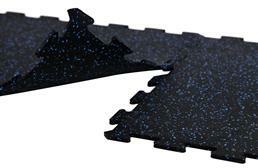 You don’t have to be a rocket scientist to figure out how to put the interlocking puzzle pieces together. In fact, it’s almost impossible to mess up! 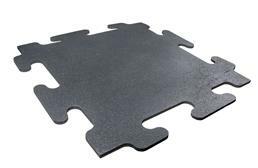 The drawback is that, for large, open gyms, commercial gym floor tiles can quickly become a tedious, ‘are we there yet’ type situation. Yes, you have to put them together one by one as opposed to laying out a few large rolls. 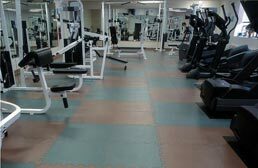 Rubber tiles for commercial gyms can become time consuming, causing your business to be shut down for a longer period of time during installation. 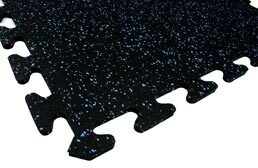 We recommend these tiles as commercial exercise room flooring (think hotel and apartment gyms) or when you have many hands to put together the puzzle for your commercial gym flooring installation. 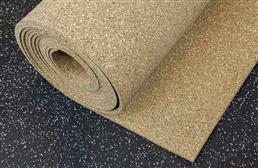 The teacher’s pet of commercial gym flooring: Commercial Gym Flooring Rolls. 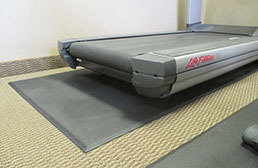 These babies are usually the first one picked for commercial fitness center flooring. The large gym floor rolls can actually be easier to install in large spaces and, typically, end up costing less in the long run. 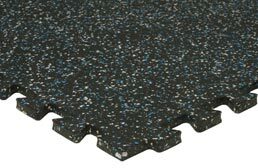 Commercial gym rubber rolls require a little more effort and specificity up front, but they quickly become the easier option when all you have to do is roll that puppy out while the gym down the street is on it’s 4th tile. 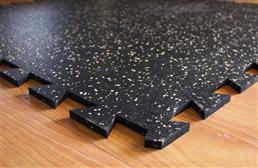 A big asset to the commercial gym flooring world is custom cut commercial gym flooring rolls. 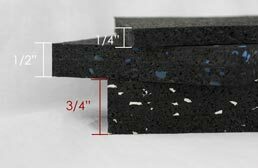 Custom cut rolls allow you to choose exactly how much flooring you are purchasing, saving you time and, sometimes, money. 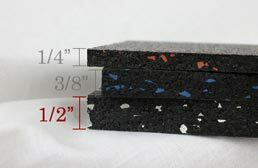 While you will typically see a lower price point on pre cut gym floor rolls, you can often save in the long run by getting the correct amount and having less flooring leftover. 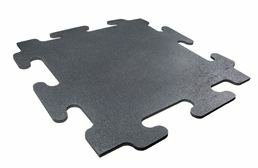 No commercial gym is complete without some commercial gym floor mats! The thing is, not everyone hangs out in the weightroom. Those ab and stretching areas are super popular, and sometimes you just find a lone spot that needs a little extra protection. 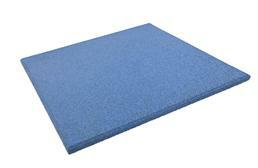 Not to worry, we’ve got commercial gym flooring mats o’ plenty! 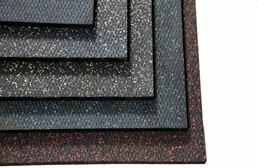 Commercial gym mats are incredibly easy to install and they come in thickness options for every application, so whether you want a planking and stretching area, or a heavy dumbbell area, you can find the perfect commercial gym flooring mat for your needs. The most common question people ask about their flooring for commercial gyms is “Which thickness do I need?” And, more often than not, they have a preconceived idea of what the answer will be...and it’s totally overboard! So many times we’ve heard people say “But I googled and it said I needed at least ½ inch!” Don’t trust google. Just don’t do it. You will never be happy with the answer. 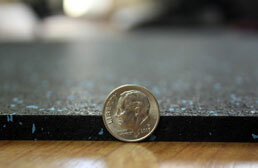 A 1/2” (or thicker) rubber floor is only necessary in areas where you will be dropping heavy weights. 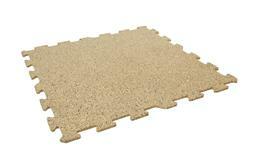 Otherwise, a 3/8” tile, roll or mat is perfect for your commercial gym space. 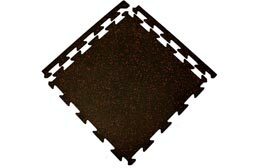 You can get by with an 8mm thickness in a lower traffic area and you can, of course, go thicker, but you don’t need to and you will end up spending more money.